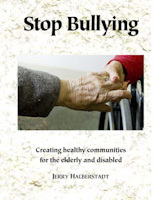 The Commission on Bullying of elderly and disabled persons in multifamily public and subsidized housing will hold "listening sessions" in the framework of hearings for the Olmstead plan in Boston on Monday, June 26 and in Springfield on Wednesday, June 28. The Commission on Bullying will be holding hearings for constituents and stakeholders to hear your ideas about policies, practices, or other solutions that the Commonwealth should consider in order to address the problem of bullying of elderly and disabled persons in public or subsidized multifamily housing. The hearings will take place in the context of the listening sessions for the Olmstead plan. Ashburton Place is close to the State House and can be reached from T Stops at Park Street and Government Center. The locations are accessible and CART and ASL Interpreters will be available. The Commonwealth of Massachusetts is updating the state’s “Olmstead Plan,” a comprehensive working plan for assisting people with disabilities so they may live and work in the community, and we need your input. The Commonwealth’s current Olmstead Plan will be updated to highlight the important integration work that has been done over the past 8 years as well as plans to continue the work going forward. The state is holding community-based LISTENING SESSIONS, inviting broad-based stakeholder attendance to provide state agency leadership with opportunities to hear directly from constituents. Sessions will be held in Boston and Springfield. You can testify about the Olmstead planning process to enable people living with disabilities to live independently in their community. Comments may be submitted on the Olmstead web page which is under development (see links below), where you will also find links to a list of the Commissioners and where you can review related documents. For more information, see http://www.mass.gov/eohhs/gov/commissions-and-initiatives/commonwealth-…. How do the current housing and services systems best help individuals with disabilities to integrate into and live successfully in the communities of their choice? What types of services and supports best allow or assist individuals with disabilities to participate in daily activities and employment settings that are integrated into the community? Are there barriers that prevent or limit some individuals with disabilities from integrating into and living successfully in the communities of their choice? Should service and support systems in the Commonwealth be changed in order to promote, and increase opportunities for, community inclusion for people with disabilities? If so, how, and if you had to prioritize, which would be the most important? Bullying poses a problem for vulnerable tenants in some public and subsidized, multi-family housing. What are some policies, practices or other solutions the Commonwealth should consider in order to address this issue? Thank you and we looking forward to hearing your suggestions. Beginning the morning of June 30th, the Executive Office of Elder Affairs will centralize the Elder Protective Services abuse report intake system (elder abuse hotline) to a single phone number, connecting the caller to a call center with specially trained intake workers here in Massachusetts. The elder abuse hotline number will remain the same (1-800-922-2275). The 24/7 single phone number will simplify the process for elder abuse reporting. All calls made to 1-800-922-2275 (day or night, 7 days a week) will go directly to the Massachusetts-based call center, regardless of the location of the reporter or the elder. It is important to note that while the initial intake will be centralized, all reports will continue to be referred to local Protective Services Agencies for screening, and if indicated, investigation and service planning.